Thought I should let you all in on a piece I provided to Jean at Social Bridge for her “Festival of Bridges” series. Jean has umpteen followers, so her site is worth visiting if not already acquainted. To find out why this bridge is special to me you will need to view the last 140 words over on Jean’s site. I’ve been an avid follower of John Grant’s blog Meticulous Mick since it started a few years back. I love his photography and his way with words. 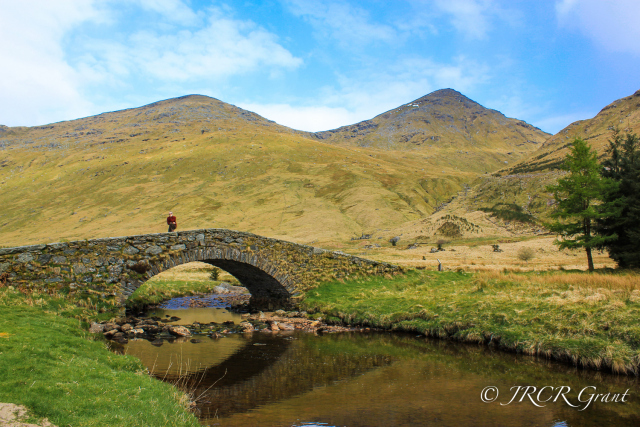 This bridge can be found in the pass of Rest and be Thankful, Argyllshire, Scotland and is known simply as the “Butter Bridge”. Completed in the mid 18th century as part of the old military road linking Dumbarton to Inveraray, it was heavily used as a drover’s route to bring cattle to the markets of the south. The new road (A83) now crosses the river a little higher up, leaving the old single span bridge in peace. The butter bridge…there’s a novel in there somewhere. What a great image and story.